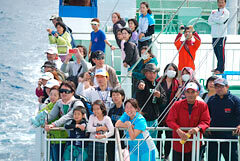 Tokashiki Island Marathon participants enjoy whale watching on the southern side of Tokashiki Island on February 2. The Executive Committee of the 9th Whales Straits Tokashiki Island Marathon invited about 200 runners and volunteers whale watching from the Ferry Tokashiki on February 2. They sailed from Tokashiki Port at 1:00 p.m. and soon encountered about 20 humpback whales that were swimming between the islands of Zamami and Tonaki. A pod of whales surrounded the ferry. The participants, some holding cameras or binoculars, cheered upon seeing the magnificent spectacle of the huge whales blowing and flicking their tails on the surface of the sea. 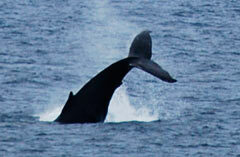 Humpback whales show their majestic figures on the southern side of Tokashiki Island on February　2.